I loved receiving this comment (I love receiving all the comments people have sent over the past year, they are always informative, interesting and often provocative), which adds to the earlier discussion in the post “Embrace-ness-ness” regarding how we view intelligence in non-verbal people and what that means. As I have mentioned before, my father spent the last 15 years of his life in a wheelchair and though he was cognitively unimpaired, he was treated differently, almost as though people thought his brain had somehow been damaged too. His accident and disability profoundly altered my view of the world. I came to see first hand the pain and suffering caused by people’s responses and misunderstandings of his disability. When we are out in public with Emma, she is a free spirit. I have never seen her look in judgement at another human being, no matter how deranged they may appear. Emma will sit next to a homeless person on the subway without a second thought. If someone smiles at her, she will smile back. Emma is without malice. She is utterly void of judgement. And yet, I see the looks of fear and confusion on the faces of those who see her and do not understand what they are seeing. I see how their eyes watch her and then move to us, trying to find a clue as to why this child is behaving so oddly. Many times people assume she is behaving as she is because of our parenting or lack of parenting. We have been given well meaning advice from countless strangers over the years, people who feel they are, no doubt, helping us. 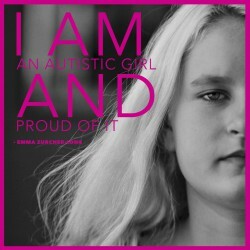 Yet, if we tell them she is autistic, this explanation is rarely met with understanding. Autism is an almost meaningless word, at this point. It covers such a vast array of behaviors and issues, it is no wonder people feel confused. Many people know someone who is autistic and assume all autistic people must share the characteristics of that person. This could not be farther from the truth however. There are people who are verbal, non-verbal, semi verbal, highly verbal, but echolaic, verbal with perseverative tendencies, etc. Some people who have received the autism diagnosis are highly functional, go on to have successful careers, excel in their chosen fields, others maintain jobs, never missing a day of work, while others cannot hold a job and will need assistance for the rest of their lives. Meeting one person with autism is like meeting one person anywhere. If that person is not able to communicate in a language we know, it doesn’t mean they can’t communicate or do not want to. We all want to communicate. Perhaps the single most destructive belief about autism is that those who are diagnosed with it have little desire for human interaction. Just because they may not be able to communicate their desires in ways we are used to, does not mean the desire doesn’t exist. If I want to communicate with Emma I just have to spend time with her. She communicates with me in a wide variety of ways constantly. Emma with her beloved balloon string – recovered from the laundry hamper. This entry was posted in Autism, language, Parenting and tagged Autism, autism children, autistic, autistic children, communication, disabilities, intelligence, language, Parenting, special needs. Bookmark the permalink.